Home / Education / Rain, rain stay today, freshen up our day hooray! Many Southern Californians don’t see rain too often, unless it’s one of those years that we have a rainy winter. Of course our plants welcome all the rain, but not everyone appreciates it when it comes for a visit. Some are uncomfortable driving in the rain, and some don’t like to get wet and some are afraid of getting muddy. Others, who do welcome the rain, will opt for a cup of hot cocoa next to a nice warm fireplace indoors. One thing that we’re all forgetting is learning to embrace the rainy weather, and remembering that we can still go outside and take a walk through those puddles! Today’s visiting school did just this, and brought their kids on a field trip despite the rainy weather. I had the opportunity to hang out with these amazing children while they explored and were involved in different activities. 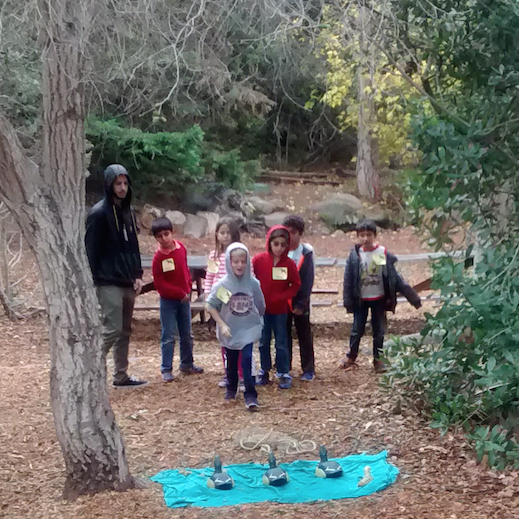 The Environmental Nature Center has native Californian animal footprints in the concrete, which led us to learning about a Native American myth about how California was made by the Great Spirit. These stories helped us all imagine the leaves blowing in the wind, and turning into chirping birds, or feeling the earth rumbling and trembling from the meeting of turtles that hold California together. We learned about the instruments the Tongva and Acjachemen once used to celebrate various ceremonies, and tools they used before we had modern machines. Outside, we tried out primitive pump drills and made holes in some shells that could be beaded into a necklace. On the next adventure, we stayed outside as the sunshine broke through some rainclouds, and went on a hike, where each child got to tell the rest of us a fact about how a tree or plant was used by the Native Americans. Redwood are used for canoes, Yucca plants are used as sewing needles and ironwood makes good digging tools. I don’t know about you, but I didn’t previously know this, and every time I come to the ENC, I learn something new about the world we live in. As you may notice, all of these activities have a Native American theme, which is great, because who else knew how to navigate the earth better than the Natives, rain or shine? These children got the chance to engage in the outdoors, and inhale the fresh scents of newly dampened plants. Have you been on a hike right after a fresh rain? If you haven’t, you should add it to your bucket list, because the amount of fresh scents you get to smell is better than any candle could ever give you. Think about being able to enjoy your favorite lavender scent in the natural world. Next time you come by the Environmental Nature Center, maybe you will get lucky and it will rain. We’ll see you soon!